About a fortnight ago HEXUS compiled a summary of newly revealed AMD B450 chipset motherboards. These were yet to officially launch but the big three motherboard makers (Asus, Gigabyte, and MSI) had already listed and detailed a wide range of products utilising the mid-range AMD chipset. Today Asus and Gigabyte officially launched their new B450 motherboards, however at the time of writing Asus has removed its blog post, while Gigabyte's Aorus press release remains online. Gigabyte has announced the release of its new B450 AORUS Motherboard series. These motherboards support all the AMD Ryzen processors, old and new, CPU and APU, and offer new 400 series chipset features such as StoreMI technology. 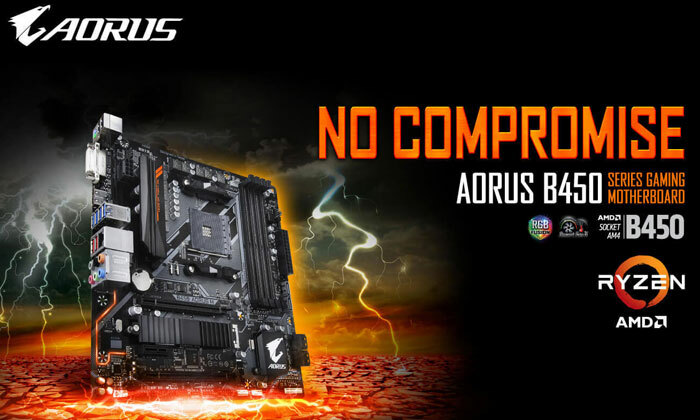 The initial lineup of B450 Aorus Motherboards consists of the B450 Aorus PRO WIFI, the B450 Aorus Pro and the B450 Aorus Elite using the ATX form factor, B450 Aorus M as the mATX solution and for Mini-ITX, the B450 I Aorus Pro WIFI. The new B450 Aorus Pro and B450 Aorus Elite are Gigabyte's top options for buyers interested in the B450 chipset. They feature a robust power design, dual M.2 design and two M.2 thermal guards and extensive connectivity options. 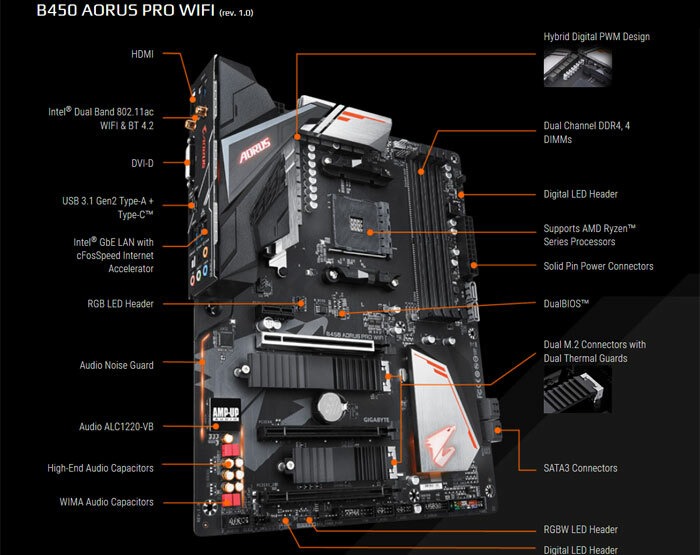 Meanwhile, the B450 Aorus Pro WIFI and B450 I Aorus Pro WIFI feature fast Intel Dual Band 802.11ac WIFI for great connectivity where there is no wired option. Gigabyte highlights the Mini-ITX model which offers the added benefits of Intel Dual Band 802.11ac Wave 2. Throughout the range, potential buyers will be attracted to features such as an updated ALC1220-VB audio codec paired with WIMA and Chemicon audio capacitors, feature-rich back panel connectivity including USB 3.1 Gen2 with both Type-C and Type A connectors, Smart Fan 5 with Fan Stop cooling technology plus multiple hybrid fan headers and temperature sensors, Gigabyte Ultra-Durable components, DualBIOS, and last but not least RGB Fusion lighting systems with multiple programmable LED illuminated zones and effects. The Asus press release about its new B450 motherboards has been taken down for now. However, Guru3D has already shared the text on its website. You can still head on over to the Asus product pages and read about each individual motherboard, but for some reason the fanfare article mentioning them all has disappeared, for now. To sum up, Asus launched the ROG Strix B450-I and B450-F Gaming, which elevate the platform with signature features for serious gamers. These are mini-ITX and full-size ATX form factors respectively. The ROG Strix B450-I features two DIMM slots, which OC to DDR4-3600 and beyond. It also features dual-band 802.11ac WiFi that provides cable-free connectivity right out of the box, and an innovative M.2 Audio Combo card to maximise board space. Meanwhile the Strix B450-F Gaming makes use of its larger board area with more expansion capacity, comprehensive cooling, customization and connectivity options, dual PCIe 3.0 M.2 slots and more. The TUF B450-Plus and B450M-Plus Gaming to focus on essentials and 'battle hardened' durability thanks to the use of high quality TUF Components comprising MOSFETs, chokes, and capacitors. These are ATX and micro-ATX form factor boards respectively. Lastly, the Asus Prime B450-Plus, B450M-A, and B450M-K which put a more professional face on the platform for those engaged primarily in content creation and everyday productivity. The top end Prime B450-Plus offers a wide range of connectivity options, Fan Xpert 4 Core, 5X Protection III safeguards, premium 8-Channel HD audio and Aura Sync lighting. 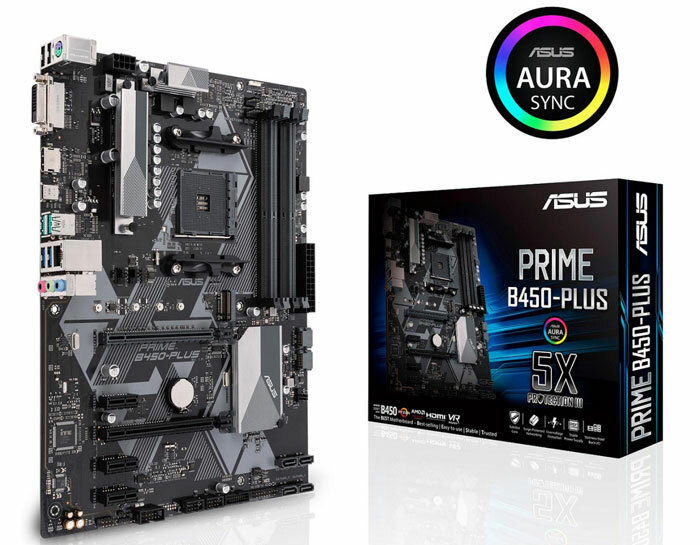 The smaller microATX Prime B450M-A and B450M-K are more minimalist in feature-sets but retain core Asus tech such as Fan Expert, 5X Protection III and DIGI+ VRM circuitry. Intel Xeon W-3175X processor released, costs $2,999 MSI MPG Z390I Gaming Edge AC gains 5.6GHz DDR4 world record Nvidia partners detail their GeForce GTX 1650 graphics cards Asus Nvidia GeForce GTX 1650 Ti graphics cards listed by EEC QOTW: What wattage is your power supply?